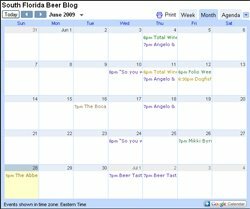 South Florida Beer Blog: Ethiopian Beer Night At The D.R.B. Today, December 8th, The D.R.B. will be starting a new around the world program to focus on a different country every month or so(details are still being confirmed). The are trying to turn people on to beers from countries other then the usual beers people know from Germany, Belgium, UK and the US. They will be starting the trek in Ethiopia where they will have specials on beers from there (Bedele and St. George). You will also find some native Ethiopian food items you can pair with the beers as well. The trek would not be complete without some music from the country being played as well. Stop by and check out what is sure to be a new experience for some. Yeah! Ethiopian food, stouts on a chilly evening, and Ethiopiques music; that's cool!